After Harley-Davidson comes out with their CVO (Custom Vehicle Operations) limited-edition models each year, we create an Easyriders version of a CVO bike. 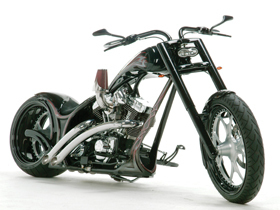 In other words, what if Easyriders created a one-of-a-kind custom in Harley’s CVO mold. We use as many genuine Harley-Davidson parts and accessories as possible to create a bad-to-the-bone custom from a stock H-D with our own Easyriders bad boy slant. Last year we chose a Road Glide to do our radical version of a Screamin’ Eagle touring bike with lots of attitude and badass flames from Damon’s Custom Paint. 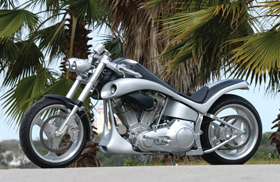 For 2003, we asked Paul James of Harley Communications what model Harley we should take the cutting torch to in order to create something new. Paul didn’t miss a beat, “How about a V-Rod,” he said. To create a truly one-off custom VRSCA, we called on world-class customizer and Harley Dealer, Russ Tom of Downtown Harley in Seattle. Russ had been working on his very own custom V-Rod, and as you can see by these photos, when we asked him to help us design a custom V-Rod, we got more than we bargained for. Downtown Harley Davidson’s customizing guru, Brian Mitchell showed us Russ Tom’s personal red V-Rod with the Rick’s custom wheels and a massive 250 rear end, along with inverted front forks for an entirely new look on a V-Rod, and we were sold. Russ even went to the trouble of customizing the V-Rod’s frame for more rider comfort and a leaner, racier profile. 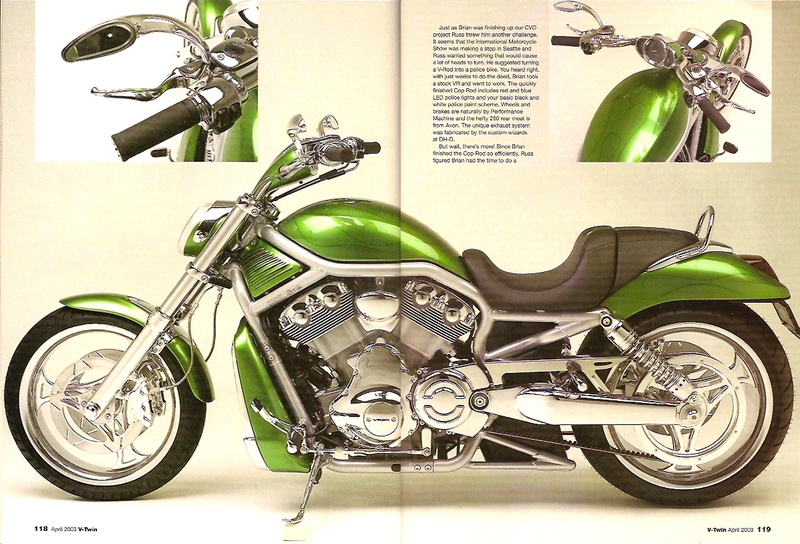 For the Easyriders CVO V-Rod we took a 2002 model and sent various silver parts off to Jesse Welch of JW Designs to create a wild metallic green paintjob with classic ghost flames. We also contacted Lorenzo of Eurocomponents in Daytona, Florida, to get their new 250 rear end kit. The Eurocomponents kit comes with everything you need to make your V-Rod the nastiest thing on the block. The kit includes wild wheels with matching rotors and rear pulley, as well as their awesome wider swingarm and all spacers and parts needed to get the job done. Lorenzo also threw in his new custom mirrors for the V-Rod as a finishing touch. The D-D brakes were replaced with the extra squeezing power of Performance Machine brake calipers front and back. In keeping with the CVO approach, we used Harley’s slip-on Screamin’ Eagle mufflers and performance upgrades such as the Screamin’ Eagle air cleaner and ECM recalibration to massage a few extra ponies out of the already potent beast. The end result is one wild ride that throws the leather gauntlet at cruiser convention. Hell, we even painted it green on purpose (against the grain of the old wives’ tale about green Harleys being bad luck). 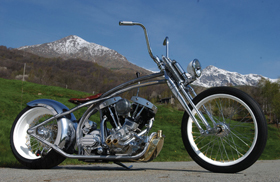 Yea, this ain’t your granddaddy’s Harley. 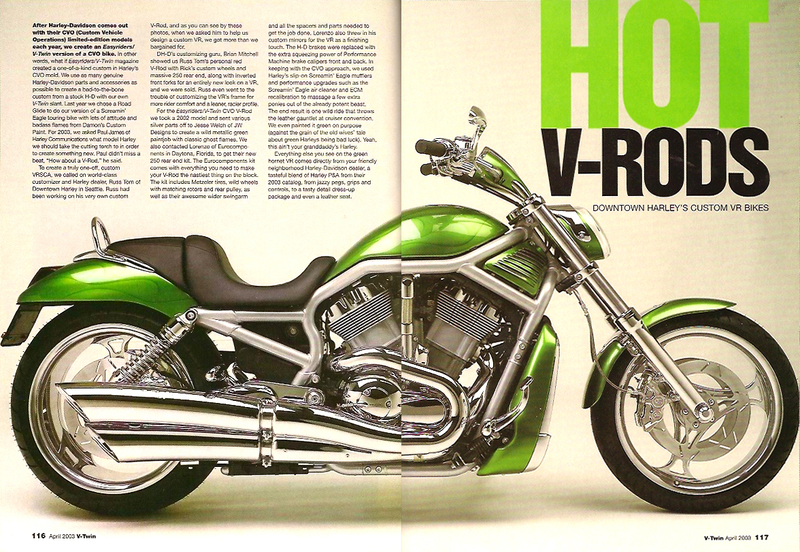 Everything else you see on the green hornet V-Rod comes directly from your friendly neighborhood Harley-Davidson dealer, a tasteful blend of Harley P&A from their 2003 catalog, to a tasty detail dress-up package and even a leather seat. Just as Brian was finishing up our CVO project Russ threw him another challenge. It seems that the International Motorcycle Show was making a stop in Seattle and Russ wanted something that would cause a lot of heads to turn. He suggested turning a V-Rod into a police bike. You heard right, with just weeks to do the deed, Brian took a stock V-Rod and went to work. The quickly finished Cop Rod includes red and blue LED police lights and your basic black and white police paint scheme. Wheels and brakes are naturally by Performance Machine and the hefty 250 rear meat is from Avon. 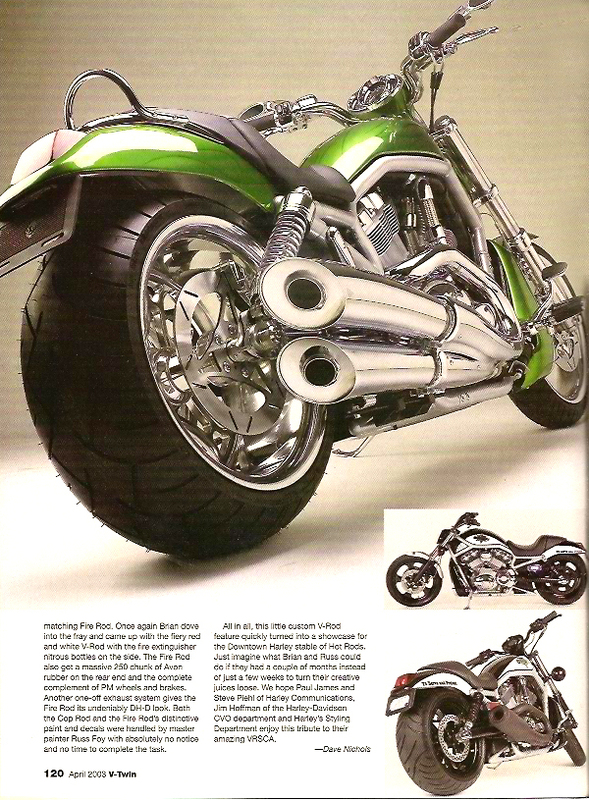 The unique exhaust system was fabricated by the custom wizards at Downtown Harley Davidson. But wait, there’s more! Since Brian finished the Cop Rod so efficiently (and had photos shot with a lovely your copperette and her radar gun), Russ figured Brian had the time to do a matching Fire Rod. Once again Brian dove into the fray and came up with the fiery red and white V-Rod with the fire extinguisher nitrous bottles on the side. The Fire Rod also got a massive 250 chunk of Avon rubber on the rear end and the complete complement of PM wheels and brakes. Another one-off exhaust system gives the Fire Rod it’s undeniably Downtown Harley Davidson look. Both the Cop Rod and the Fire Rod’s distinctive paint and decals were handled by master painter Russ Foy with absolutely no notice and no time to complete the task. All in all, this little custom V-Rod feature quickly turned into a showcase for the Downtown Harley stable of Hot Rods. Hell, imagine what Brian and Russ could do if they had a couple of months instead of just a few weeks. 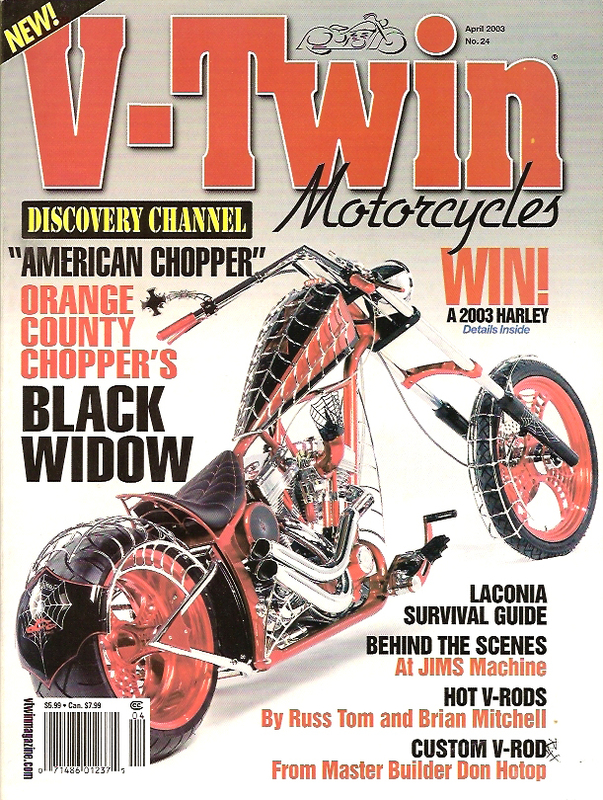 We hope Paul James and Steve Piehl of Harley Communications, Jim Hoffman of the Harley-Davidson CVO department and Harley’s Styling Department enjoy this tribute to their amazing VRSCA.